Presents a real-world example of using an interdisciplinary approach to solutions to the effects of Superstorm Sandy and predicted future climate change. Teachers and students could use this video to develop powerful essential questions and investigations. For example, students can take on roles of stakeholders and evaluate the top proposals in a mock scenario. 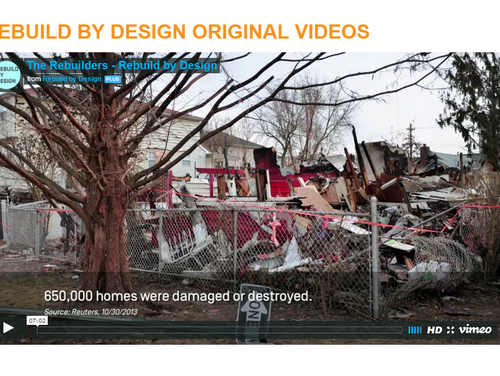 Note that the original video and project (described here) date from 2015; the current state of each of the funded projects is presented on this website Rebuild By Design 2 years Later [link http://www.rebuildbydesign.org/resources/videos]. proposing innovative and implementable large-scale, design-driven infrastructure solutions. Presents solutions to the effects of climate change as interdisciplinary, using science and local knowledge to build resilience. The video discusses the importance of incorporating the local knowledge of vulnerable communities into solutions. Lacks teacher guide for a guided discussion or further questions.